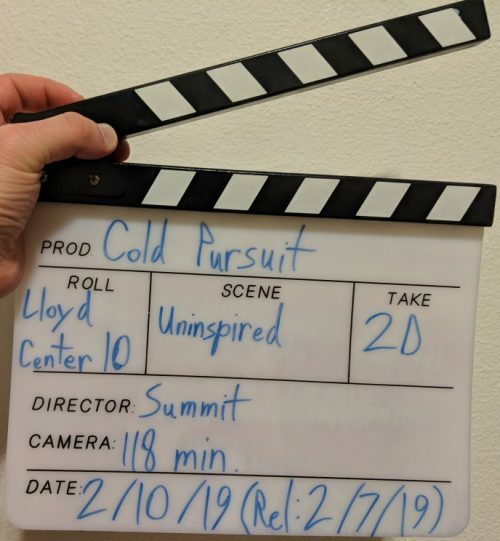 Cold Pursuit follows Nelson Coxman (Liam Neeson), a snowplow driver and occasional hunter living in the town of Kehoe, Colorado, three hours out from Denver. He’s honored with the town’s “Citizen of the Year” award, just before his son dies of a heroin overdose. The kicker: Kyle Coxman (Micheal Richardson) wasn’t a druggie. And we can see for ourselves that Kyle was kidnapped in a terribly botched attempt at staging a drug OD. Long story short, Nels goes on a killing spree, looking for answers in the local criminal underworld. In the process, he inadvertently starts a turf war between the local drug rings and bodies pile up very high, very quickly. Right off the bat, when you’re talking about a crime thriller with elements of dark comedy — with a cold and snowy rural setting — the first thing that comes to anyone’s mind is Fargo. And to be sure, there’s more than a little of the Coen Brothers in this movie’s DNA. But when I look at this misanthropic movie with its defiant lack of sympathetic characters mocking each other and killing each other over the course of a multilayered plot, I see a lot more influence from Martin McDonagh. Not that I have a problem with filmmakers taking influence from other filmmakers — we all have to learn from someone, and a storyteller could do a hell of a lot worse than learning from grandmasters like McDonagh or the Coens. The problem is that these filmmakers lift from those other great auteurs without adding much of anything new. There’s nothing in here that I couldn’t get from watching those other movies that have better comedic timing, more inventive plots, wittier dialogue, and more incisive themes. To be clear, it’s not that the dialogue or the characters are awful — even a watered-down imitation of the Coens can still be good on its own merit. And if the plot isn’t as intricate or convoluted as a McDonagh script… well, there’s something to be said for a crime thriller with a plot that’s easier to follow. The plot to this movie was twisty enough to keep me guessing without ever leaving me confused, I’ll give it that. I must also give kudos for some of the action scenes, most especially that exquisitely bloody climax. Alas, the filmmakers show a disappointing lack of aptitude with regard to comedic timing. So many gags and scenes — especially at the beginning — fall flat because they’re drawn-out and tedious when the filmmakers were clearly going for laughs. While a couple of jokes are indeed funny, the movie as a whole still lands in an awkward place where it isn’t quite a drama and it’s not quite a black comedy. Moreover, I’m disappointed by the lack of any quotable lines or memorable characters. Liam Neeson’s character is more or less another rerun of Taken, but ten years older. Tom Bateman makes for an effective hate sink, but nothing to write home about. William Forsythe and Laura Dern are both gone from the movie before they can do anything interesting. Emmy Rossum is putting in a noble try, but she’s got pretty much nothing to work with. Dominick Lombardozzi is always a welcome presence, but all he’s got are a couple of character reveals that go nowhere. Still, at least Tom Jackson is suitably imposing, and Julia Jones makes a fantastic sounding board against Bateman. Thus the film takes on a kind of absurd quality, reducing all our actions and ethics to nothing because we’ll all be dead anyway. Though the movie does put a great deal of weight on the theme of parents and sons, which could be interpreted as a reflection on what we leave behind. To be clear, this is all very subtle — just enough to hint at something deeper without getting in the way of those who simply want to see bad guys killing each other. Kudos are also due for the more subtle thematic touches. My personal favorite was the twenty-dollar bill that gets shot by a Native American gangster. There’s so much to unpack in that sequence of events, and the setup to that payoff was masterfully done. So is Cold Pursuit a bad movie? No. It works perfectly well as a crime thriller, with enough twists and turns and shootouts to keep an audience interested, and the film’s morbid sense of humor provides a keen yet subtle edge. The problem is that there’s very little here that hasn’t already been done and done better in so many other movies. There’s no reason to see this when you could be watching anything from the Coen Brothers or Martin McDonagh instead. Even in these lean February weekends, I can’t find the heart to recommend this for more than a home video viewing.